This entry was posted in Midd Blogosphere and tagged Midd Points on August 2, 2017 by Joseph Antonioli. This entry was posted in Midd Blogosphere and tagged For Faculty, For Staff on April 17, 2016 by Joseph Antonioli. In-progress project presentations are open meetings, anyone may attend. David creates accounts for faculty and students. In the desktop version, each student needs to install multiple packages; with RStudio Server, a faculty or an admin installs all packages in one location and students don’t need to. R Markdown: combines text, R code, graphics are embedded in one document. Standardized and easier to grade. Some upper-level courses require students to download the desktop version of RStudio, it is important for them to understand this environment. The server version is most useful for entry-level courses and limited use within a course as it reduces the time needed to set up the software. VPN may be necessary for MIIS to access RStudio, this should not be the case. David will work with Chris to see why this may be happening. To go live, we would need to set up with Active Directory. Do we want people to add RStudio via the Course Hub using a self-service model, or do we them to contact AT? David and Joe will communicate about this. Shiny Server Pro: create interactive apps and graphics without needing any tech knowledge. Graphics are interactive, changing the variables changes the graphic display in real time. You can host apps on free shinyapps.io or you can install Shiny Server Pro and serve on your own servers. Free for academic institutions with proof of syllabus. The Middlebury-hosted service is much more responsive. We would like to share these services with other faculty. Albert and Bill will communicate and set up a demonstration, possibly through CTLR programming. The Project Team is learning a lot about our environment through working on this project. Q: Why does the inventory include services like Facebook, Twitter, Scrivener, etc.? We know these services are being used for academic work. For comparison with similar services. To track the continuum of moving from service to service over time. 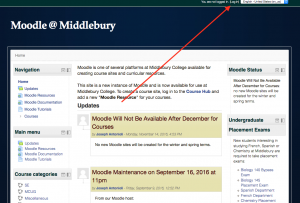 A viewable/usable version of the inventory should include a filter for Middlebury-supported services. Once the Project Team has completed the categorization phase, the project will be shepherded by the ACTT working with ITS to deploy the information in a web-accessible format. It will include search functions for faculty, staff and students, with some protected information behind authentication for staff that need to track dependencies, for instance. This entry was posted in Midd Blogosphere and tagged For Faculty, For Staff on April 1, 2016 by Joseph Antonioli. This entry was posted in Midd Blogosphere and tagged For Faculty, For Staff on March 30, 2016 by Joseph Antonioli. This entry was posted in Midd Blogosphere and tagged For Faculty, For Staff on March 29, 2016 by Joseph Antonioli. The New Media Consortium (NMC) and EDUCAUSE Learning Initiative (ELI) are jointly releasing the NMC Horizon Report > 2016 Higher Education Edition at the 2016 ELI Annual Meeting. This 13th edition describes annual findings from the NMC Horizon Project, an ongoing research project designed to identify and describe emerging technologies likely to have an impact on learning, teaching, and creative inquiry in higher education. This entry was posted in Midd Blogosphere and tagged For Faculty, For Staff on February 12, 2016 by Joseph Antonioli.